NOTE: The very use of the English word ‘rightEOUSness’ for translating δικαιοσύνη tenses, including the above passage from Romans, betrays a Latin bias (the etymology EOUS suggesting a ‘permeating quality’). It should be translated ‘justification’, ‘justness’, or ‘rightness’ to convey the original meaning. The position of this study assumes the apostolic message of grace and justification as re-affirmed in the original 16th century Reformation and continuing reformers since that time, in line with those who stand in the predestinarian tradition against Arminius and Wesley and all synthetic positions in-between. The basic sovereign grace perspective of the five points of the synod of Dordrecht is confessed, along with additional long-ignored gospel truths known to readers that have been expounded by the current writer for over 20 years. There will be no attempt to newly defend these doctrines in the present article. The doctrine of an objective grace and justification residing solely in Christ’s divine-human person and saving work, assured solely and unwavering for all eternity by the Holy Spirit’s gift of assenting faith, affirmed in the passages above and the entire New Testament kerygma, this is our gospel. Justification (a just status from God resulting in eternal salvation) is achieved solely through divine grace, which is the equivalent of God’s transforming power communicated initially in water baptism. Acceptance with God is based on gradual transformation of the sinner and can be lost at any time through free-will neglect of good works. Final justification cannot be assured in the present life, since no one can be certain of enough acquired merit in almsgiving before death. Yet salvation is owed to God’s grace alone, since only He gives unworthy sinners the power and free-will to acquire merits throughout life. Such is the great scheme of doctrine known in history as the Pauline, Augustinian, or Calvinistic, taught, as we believe, in the Scriptures, developed by Augustine, formally sanctioned by the Latin Church, adhered to by the witnesses of the truth during the Middle Ages, repudiated by the Church of Rome in the Council of Trent, revived in that Church by the Jansenists, adopted by all of the Reformers . . . It is a historical fact that this scheme of doctrine has been the moving power in the Church . . . This is the first great argument in support of the Pauline or Augustinian scheme of doctrine. . . It can hardly be doubted that if these simple principles be granted, the truth of the Augustinian scheme must be admitted. Charles Hodge, Systematic Theology, Part III, Ch. 1, Section 8 “The Augustinian Scheme”. Although C.H. equates the doctrine of Augustine with that of Paul and Calvin, he decided to name this section of his work The Augustinian scheme! Not the Calvinistic scheme, the Pauline scheme, or the apostolic or biblical scheme. This perhaps betrays to us who his most admired teacher was. The worst lie pushed onto us by Reformed teachers is the dogma of the soteriological orthodoxy of Augustine and his patristic predecessors. It has never been repented of. The lie has led to hopeless paradoxical confusion in understanding God’s grace, ended the progress of the Reformation in its tracks, and opened the door to every possible heretical movement taking over Reformed and Protestant churches permanently. The doctrines of Arminius, Wesley, Menno Simons, and others very much agree with Augustine’s view of ‘initial’ and ‘final’ justification—a grace that can be lost in the final judgment through free-will neglect. The apostasy of the early ‘fathers’ into Neo-Nomianism was the starting point of this heresy. Now the same doctrine is sweeping the ‘Calvinistic’ churches as a wildfire. Does anyone honestly believe that such false union of Paul and Augustine as teaching identical doctrine, proposing that Gus taught the exact same gospel revealed to Paul directly by Christ, hasnothing to do with the end of the Reformation and a potential return to a thousand years of darkness? No one can mistake the popular Catholic features of this (Augustine’s) system of religion. It is based on the ancient Symbol. The doctrines of the Trinity and Two Natures are faithfully avowed. The importance of the Catholic Church is strictly guarded, and its relation to the heavenly Church, which is the proper object of faith, is left as indefinite as the current view required. Baptism is set in the foreground as “the grand mystery of renovation,” and is derived from Christ’s death, in which the devil has obtained his due. Faith is only regarded as a preliminary condition; eternal life is only imparted to merits which are products of grace and freedom. They consist of works of love, which are summed up in almsgiving. Almsgiving is freely treated; it constitutes penance. Within the Church forgiveness is to be had for all sins after baptism, if only a fitting satisfaction is furnished . . . The problem which Augustine bequeathed to the Church for solution, the Church required a thousand years to solve. But even so, it is Augustine who gave us the Reformation. For the Reformation, inwardly considered, was just the ultimate triumph of Augustine’s doctrine of grace over Augustine’s doctrine of the church. 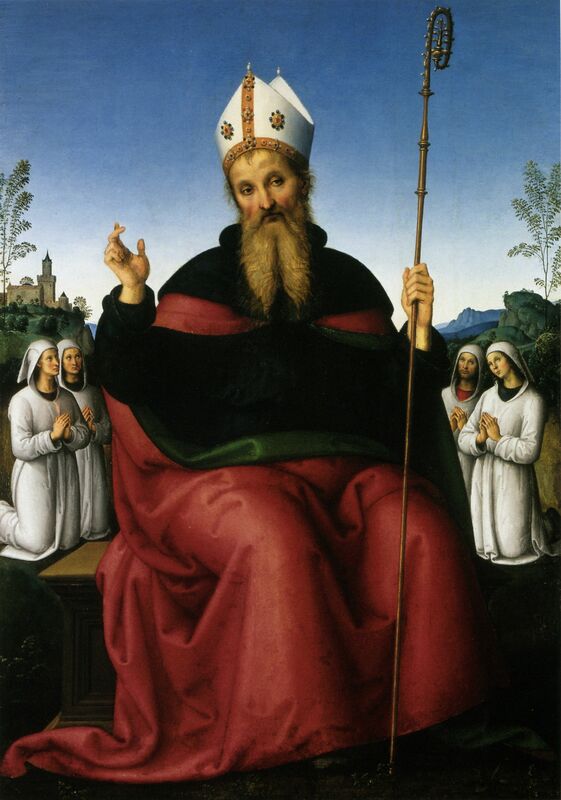 This doctrine of grace came from Augustine’s hands in its positive outline completely formulated: sinful man depends, for his recovery to good and to God, entirely on the free grace of God . . . The Council of Trent, with its emphasis on meritorious and progressive ‘internal grace,’ only re-states the doctrine of Augustine in his major works. Similarly, the denial of assurance of personal election and final perseverance only mimics the teaching of Gus and earlier ‘fathers’. In spite of this, Protestant authors like Hodge (see quote from last section) allege that Gus is the nemesis of Trent. But the issue is not fine point differences with the Council of Orange regarding anti-Pelagianism. What sense are we to make of all this contradiction and paradox? The answer is not hard to find. It lies within the teachings of Augustine himself. Within the same breath he constantly oscillates between a theology of grace residing wholly in God and one of human merit as the ground of salvation. It is no easy task to make sense of his high-minded double-talk. The following quotes are from the Enchiridion, which is a manual on the ‘Christian life’ written by Gus and intended for the common ‘man in the pew’. Let there be no misunderstanding, it teaches the exact same doctrine as “The City of God”, “On Grace and Free Will”, and other works. Quotations evidencing the same views time and again could easily be supplied from these or many other works from his massive writings (which the present author has read). But the Enchiridion was composed in the latter days of Gus while still finishing The City of God, 7-8 years before his death, and represents a fairly mature perspective on Augustine’s doctrine. Why should there be such great glory to a human nature–and this undoubtedly an act of grace, no merit preceding unless it be that those who consider such a question faithfully and soberly might have here a clear manifestation of God’s great and sole grace, and this in order that they might understand how they themselves are justified from their sins by the selfsame grace which made it so that the man Christ had no power to sin? Thus indeed the angel hailed his mother when announcing to her the future birth: “Hail,” he said, “full of grace.” And shortly thereafter, “You have found favor with God.” And this was said of her, that she was full of grace, since she was to be mother of her Lord, indeed the Lord of all. Yet, concerning Christ himself, when the Evangelist John said, “And the Word became flesh and dwelt among us,” he added, “and we beheld his glory, a glory as of the only Son of the Father, full of grace and truth.” When he said, “The Word was made flesh,” this means, “Full of grace.” When he also said, “The glory of the only begotten of the Father,” this means, “Full of truth.” Indeed it was Truth himself, God’s only begotten Son–and, again, this not by grace but by nature–who, by grace, assumed human nature into such a personal unity that he himself became the Son of Man as well. Wherefore, since a thing may be “born” of something else, yet not in the fashion of a “son,” and conversely, since not everyone who is called son is born of him whose son he is called–this is the very mode in which Christ was “born” of the Holy Spirit (yet not as a son), and of the Virgin Mary as a son–this suggests to us the grace of God by which a certain human person, no merit whatever preceding, at the very outset of his existence, was joined to the Word of God in such a unity of person that the selfsame one who is Son of Man should be Son of God, and the one who is Son of God should be Son of Man. Thus, in his assumption of human nature, grace came to be natural to that nature, allowing no power to sin. This is why grace is signified by the Holy Spirit, because he himself is so perfectly God that he is also called God’s Gift. He himself is therefore sin as we ourselves are righteousness–not our own but God’s, not in ourselves but in him. Just as he was sin–not his own but ours, rooted not in himself but in us–so he showed forth through the likeness of sinful flesh, in which he was crucified, that since sin was not in him he could then, so to say, die to sin by dying in the flesh, which was “the likeness of sin.” And since he had never lived in the old manner of sinning, he might, in his resurrection, signify the new life which is ours, which is springing to life anew from the old death in which we had been dead to sin. This is the meaning of the great sacrament of baptism, which is celebrated among us. All who attain to this grace die thereby to sin–as he himself is said to have died to sin because he died in the flesh, that is, “in the likeness of sin”–and they are thereby alive by being reborn in the baptismal font, just as he rose again from the sepulcher. This is the case no matter what the age of the body. For whether it be a newborn infant or a decrepit old man–since no one should be barred from baptism–just so, there is no one who does not die to sin in baptism. Infants die to original sin only; adults, to all those sins which they have added, through their evil living, to the burden they brought with them at birth. The first man brought sin into the world, whereas this One took away not only that one sin but also all the others which he found added to it. Hence, the apostle says, “And the gift of grace is not like the effect of the one that sinned: for the judgment on that one trespass was condemnation; but the gift of grace is for many offenses, and brings justification.” Now it is clear that the one sin originally inherited, even if it were the only one involved, makes men liable to condemnation. Yet grace justifies a man for many offenses, both the sin which he originally inherited in common with all the others and also the multitude of sins which he has committed on his own. However, when he the apostle says, shortly after, “Therefore, as the offense of one man led all men to condemnation, so also the righteousness of one man leads all men to the life of justification,” he indicates sufficiently that everyone born of Adam is subject to damnation, and no one, unless reborn of Christ, is free from such a damnation. And after this discussion of punishment through one man and grace through the Other, as he deemed sufficient for that part of the epistle, the apostle passes on to speak of the great mystery of holy baptism in the cross of Christ, and to do this so that we may understand nothing other in the baptism of Christ than the likeness of the death of Christ. The death of Christ crucified is nothing other than the likeness of the forgiveness of sins–so that in the very same sense in which the death is real, so also is the forgiveness of our sins real, and in the same sense in which his resurrection is real, so also in us is there authentic justification. We must beware, however, lest anyone suppose that unspeakable crimes such as they commit who “will not possess the Kingdom of God” can be perpetrated daily and then daily redeemed by almsgiving. Of course, life must be changed for the better, and alms should be offered as propitiation to God for our past sins. But he is not somehow to be bought off, as if we always had a license to commit crimes with impunity. For, “he has given no man a license to sin”–although, in his mercy, he does blot out sins already committed, if due satisfaction for them is not neglected. For the passing and trivial sins of every day, from which no life is free, the everyday prayer of the faithful makes satisfaction. For they can say, “Our Father who art in heaven,” who have already been reborn to such a Father “by water and the Spirit.” This prayer completely blots out our minor and everyday sins. It also blots out those sins which once made the life of the faithful wicked, but from which, now that they have changed for the better by repentance, they have departed. The condition of this is that just as they truly say, “Forgive us our debts” (since there is no lack of debts to be forgiven), so also they truly say, “As we forgive our debtors”; that is, if what is said is also done. For to forgive a man who seeks forgiveness is indeed to give alms. “On the Predestination of the Saints” and “The Gift of Perseverance”, the very last works of Gus, were written in his final days. Those writings and their contradictory paradoxes, evidencing no clear remorse for earlier teachings but revealing a confused and frustrated man, will be evaluated in the next study on Augustine’s “Partial Determinism”. It is clear that when Gus finally confronted the reality of what Paul actually taught regarding the grace of God, he did not know where to go from there. It would be a mistake to consider these things without contemplating the enormous dependence on Augustine on philosophy and psychology for his views. Many critics have labeled him the theologian of the Western introspective conscience, noting the absence of a ‘conscience obsession’ in Paul and the biblical authors (notably Krister Stendahl, “The Apostle Paul and the Introspective Conscience of the West”, The Harvard Theological Review, Vol. 56 No. 3, Jul. 1963, pp. 199-215). Generally speaking, however, Neo-Paulinist scholars are unreliable as theologians in the estimation of the present writer and cannot be recommended. The ‘covenant community’ ethic (whether named Jewish, Christian, or anything else) of Neo-Paulinism, with its ‘Don’t be selfish and worry about individual salvation’ emphasis, does nothing whatsoever to appease guilt! Nonetheless, it is true that obsession with a guilty conscience and the deeds that might kill it is entirely foreign to the message of the Bible. The gospel is a message of deliverance from all guilt once for all time through confidence in the finished work of Christ, in community (Heb. 10:35-39)! It was in the spheres of psychology and metaphysics that the dominion of Augustine was most complete. He aspired to know nothing, he tells us, but God and the soul; but these he strove with all his might to know altogether. His characteristic mark as a thinker was the inward gaze; the realities of consciousness were theprimary objects of his contemplation; and from them he took his starting point for reflection on the world. Antiquity supplies no second to him in the breadth and acuteness of his psychological observation. And in his establishment of “immediate certainty of inner experience,” as Windelband calls it (A History of Philosophy, pp. 264, 270, 276), in “the controlling central position of philosophic thought” he transcended his times and became “one of the founders of modern thought.” If he may truly be said to have derived from Plato and Plotinus, in a far truer sense he stood above his Neo-Platonic teachers, and of his lineage have come Descartes and Malebranche and all that has proceeded from the movements of thought inagurated by them. By what evidence does Gus rise above his Neo-Platonic teachers in this regard? I would propose that this question remains unanswered by Warfield. Do Reformed teachers honestly believe that Augustine perpetuated no false teachings as a result of his excessive schooling in philosophy and admiration of Plotinus, ones that now have been perpetuated for over 1½ millennia? But the uncovering of these errors for posterity is the purpose of this and the studies to follow! Previous A Muslim protecting Christian doctrine; Unknowingly! Next The (high) role of Mary in P.Oxy. 2 (P1)?, or Holy Protestant Heresy, Pope Peter!